There are certain places that bring back wonderful memories every time you think of them. Saline Beach on St. Barth in the Caribbean is that type of place for the client who ordered this watercolor. 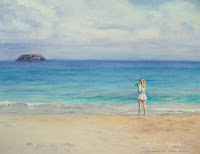 She has a photo of herself at the scene which her husband loves, and she decided an original painting would make a great gift. I agree! 1. The sky: The sky illuminates the land, sea and everything it shines upon, so it makes sense to begin an outdoor painting with the sky. 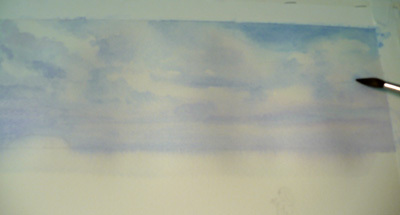 Before the paper dries completely, I add more color to show sky peeking through and shadows under the clouds. 3. 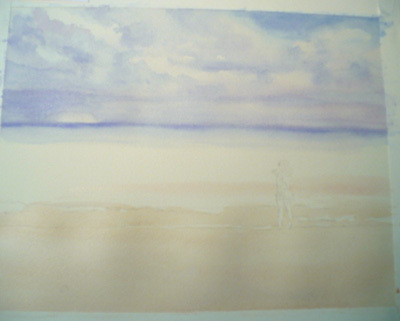 The sand: while waiting for the horizon to dry, I paint a pale wash of color for the foreground sand - see below. Notice how much the paper is buckling from the wet paint. Since I have stretched and stapled the paper to a board, it will smooth out once it is dry. For parts of the painting, especially the water, I will paint many washes one on top of the other to create a deep, rich, glowing color. Each time, I allow the paper to dry in between. 4. 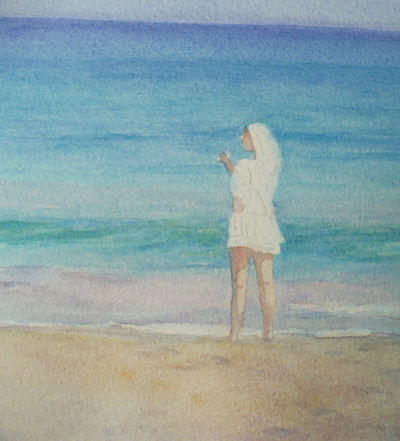 The water: Next I paint light washes for the beautiful turquoise water. Then I let that dry. I've painted the rock outcrop in the distance and then continue to paint many layers of color for the water, adding some details to denote waves. 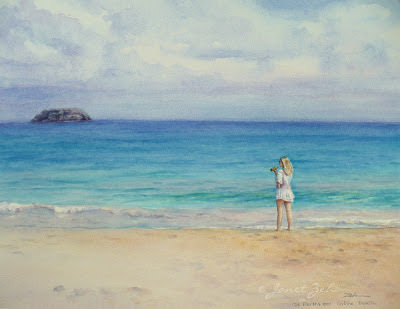 I use Winsor and Newton Cobalt Turquoise along with Winsor Blue to create a gorgeous tropical turquoise color for the water. Then I continue painting until the figure is finished. 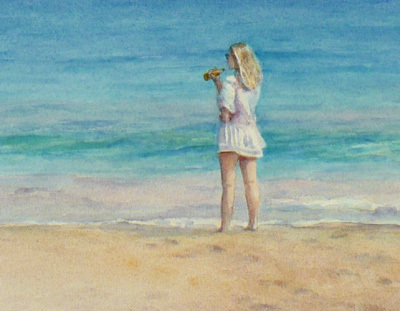 She is holding a Corona beer bottle, so I make sure it has a golden color (below). Once she is finished, I touch up the details of the water and sand until I'm satisfied and "Saline Beach, St. Barths" is done! You can click the image to see it larger. People often ask me how long it takes to do a painting. It all depends. 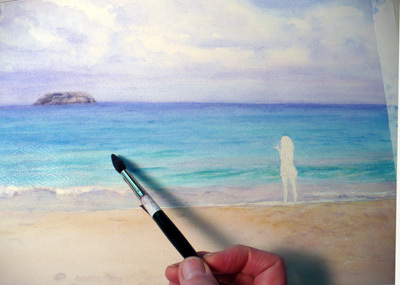 When there are many layers of color, it can take quite a few days because I like to let the paint air dry in between. 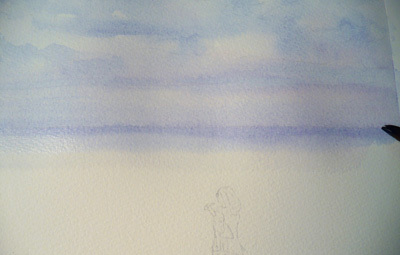 I also like to let a painting just sit for a while before painting the next step. 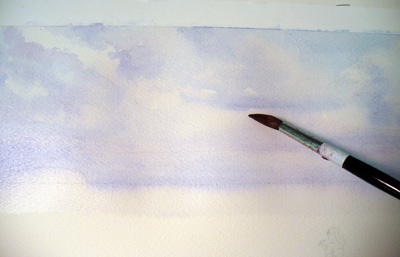 If I try to rush a watercolor, I usually end up having to do it twice! 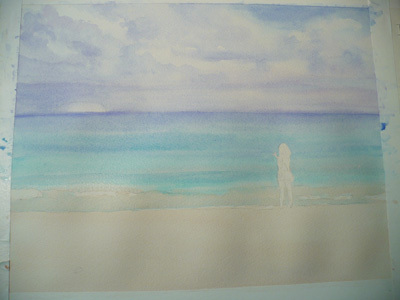 Walking away from it in between steps means I will be less likely to over paint and/or ruin the freshness of the watercolor.